Have you struggled with getting an appropriately sized wheelchair for your patient? Do you know what things you should be measuring for your wheelchair seating to be effective? Do you just grab the first wheelchair you can find? Let’s make wheelchair seating and fitting simple as possible. Five keys to appropriate wheelchair seating. Seat height is the distance from the floor to the seat of the wheelchair. It is determined by measuring the distance from the patient’s heel to their popliteal fold and adding two inches. Seat depth is the distance from the front of the seat to the back of the seat. It is determined by measuring the distance from the patient’s posterior buttock to the popliteal fold and subtracting two inches. Seat width is the distance from one side of the seat to the other. It is determined by measuring the widest part of the patient’s hips and adding two inches. Back height is the distance from the top of the back portion of the seat to the bottom. It is determined by measuring the distance between the seat of the chair to the patient’s axilla, and subtracting four inches. Armrest height is the distance between the seat and the top of the armrest. It is determined by measuring the distance between the seat of the chair and olecranon, and adding one inch. Fit two fingers between the edge of the seat and the patient’s popliteal fold. Fit your hands, placed vertically, between the patient’s thighs and the armrests. 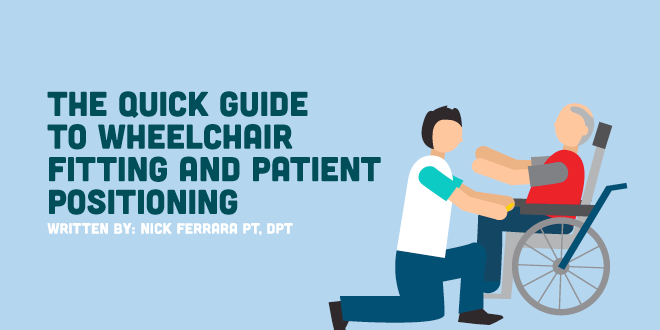 The patient should obviously look comfortable, be sitting in an upright posture, and be able to operate the wheelchair without areas of excessive pressure or friction. A wheelchair that fits properly will both maximize mobility and ensure proper safety and support. In addition to properly fitting the wheelchair, it is necessary to educate the patient and their family members or caregivers on proper pressure relief techniques and a pressure relief schedule. Long term patient positioning must be considered for the prevention of pressure ulcers, as well as contractures. Know common locations of pressure ulcers and contractures. Be able to position a patient into supine, prone, sidelying, hooklying, etc. Depending on the needs of the patient, they may need to be positioned one way or another, or a position may be contraindicated. Being able to position someone safely and effectively in a variety of ways will reduce the risk of pressure ulcers and contractures. Educate your patient, their family, and their caregivers. Watch out for patients with special considerations. Some patients may have special considerations you may need to take into account when positioning them. For example, patients with transfemoral amputations should not have their residual limb positioned in hip flexion, and patients with transtibial amputations should not have their residual limb positioned in knee flexion. Contractures into hip flexion and knee flexion make walking with a prosthetic much more difficult later on. Patients with burns need to be splinted in positions of function and special care should be taken on areas that are very seriously burned. If a patient has other precautions, such as spinal precautions, sternal precautions, etc, you need to make sure you are adhering to them. Skin check, skin check, skin check. It is easier to prevent an issue than to fix it afterwards. It is good idea to get into the habit of assessing a patient’s skin regularly in order to stop a problem before it even starts. If you see something going wrong, assess the situation, make changes, and reassess later. As physical therapists, we are in the best position to help with this aspect of patient care. Sizing a wheelchair and positioning a patient is simple, easy, and can go a long way to prevent any complications during their care. Make sure you don’t forget these often overlooked aspects of our job!